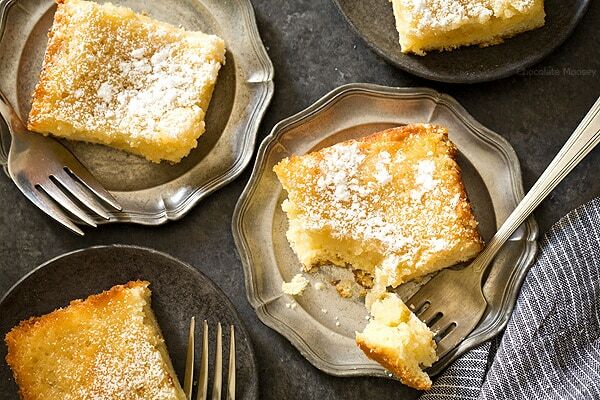 No need to drive to St. Louis when you’re craving St Louis Gooey Butter Cake – a flat, dense cake with gooey, buttery center topped with a touch of powdered sugar. Grab your fork and dig it! The best part about traveling is being inspired in the kitchen when you return home. Last month, my parents, brother, and I went on a road trip vacation to St. Louis with stops along the way in Indianapolis (which is apparently shut down on Sundays?) and Louisville. 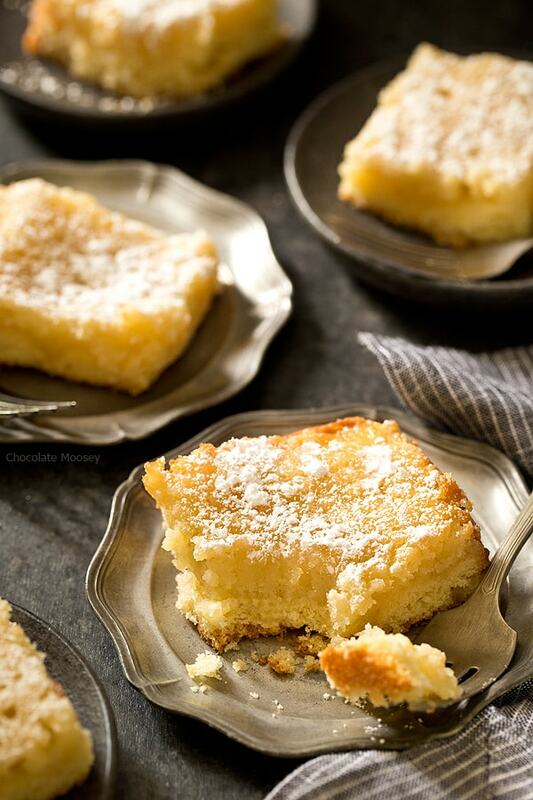 I was in charge of researching places to eat and learned St. Louis is known for gooey butter cake, which is a flat, dense cake with a gooey, buttery center (hence the name). I made Apple Butter Gooey Butter Cake last year, but research showed me I haven’t had a true gooey butter cake until I’ve had one from St. Louis. We definitely found the best cake in St. Louis, and to this day I still keep thinking about it, which means only one thing – time to recreate it at home so I don’t have to drive another 10 hours to buy one. 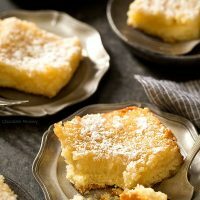 I learned there are two different kinds of gooey butter cake – authentic St Louis gooey butter cake that uses yeast and one that uses cake mix (or a homemade version of cake mix). I kept going back and forth between which type to make for my post. After much research, I decided to stick with the yeast cake as it sounds like it was the original recipe before the recipe was adapted for modern times. Then came my next decision – do I leave it as traditional as possible or do I add other flavors such as chocolate or lemon? Since I preferred traditional during my travels, I stayed traditional. The other cakes may come later in the future. If I had to describe what traditional tastes like, I would say a combination of vanilla and butter, like a heavenly slice of yellow cake but with a gooey texture, almost as if it was slightly underbaked. Then you dust it with a small shower of powdered sugar with an extra touch of sweetness, which means you don’t have to spend extra time (or ingredients) making a frosting for it. Ready to dig in yet? 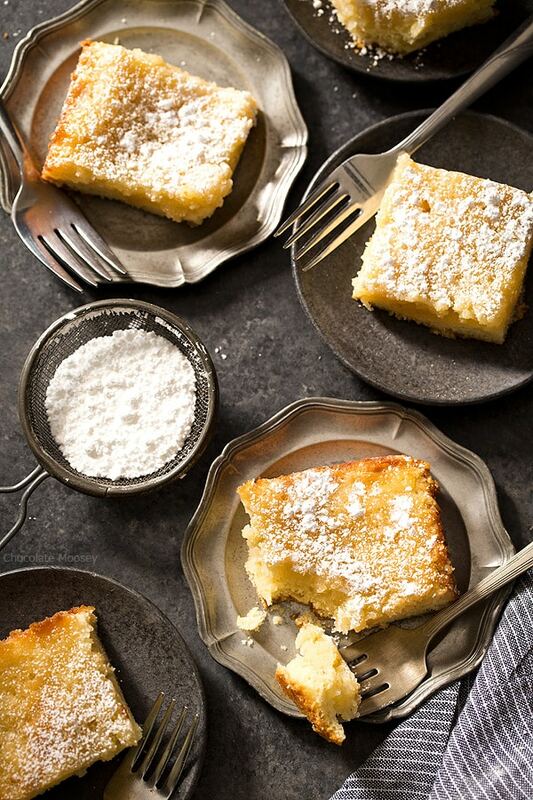 Since St. Louis is famous for gooey butter cake, we had to put it on our list to try. First up was Park Avenue Coffee where they make over 70 flavors with 12 flavors in rotation every day. It was much thinner than I expected, but still delicious nonetheless. Believe it or not, my favorite was the traditional one with chocolate as a close second. The raspberry was my dad’s favorite. The second place we tried was Gooey Louie and was not what I expected. I thought I could walk in and grab a slice, but turns out they only sell whole cakes, which worked out for the four of us. The minute I picked up a box, I knew I was in for a treat because it was still warm. 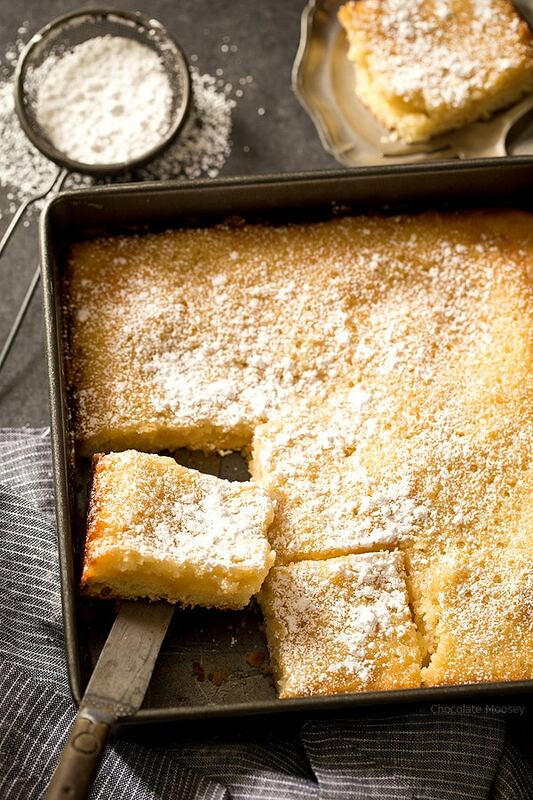 The only thing better than a gooey butter cake is a warm gooey butter cake. The guy explained to me they didn’t have the proper permit to allow us to eat there, so we took it to a parking lot and dug right into the box. I’m not kidding when I say that was probably the best thing we ate all trip. Although you can’t go wrong with either place, if you’re in St. Louis and can only pick one, go with Gooey Louie first. The yeast layer is a little unusual for a cake recipe, but it does make a tender crumb. It also means you need to let the dough rise for 2 hours before finishing the cake, so you need to plan ahead of time. It’ll be worth it though because once you finish baking and take that first bite, you’ll instantly forget how long you had to wait. Want to see more travel photos? I’m (slowly) adding them to my @citylifeadventures Instagram account. Be sure to follow along! 2 tablespoons lukewarm milk, about 100 degrees F.
Lightly grease an 8x8 square pan. In a small bowl, add lukewarm milk. Sprinkle yeast evenly on top. Let sit for 5 minutes then stir to dissolve. In a mixing bowl, beat together butter, sugar, and salt until light and creamy, about 2-3 minutes. Beat in the egg for another minute. Scrape down the bowl. On low speed add the flour mixture alternating with the milk, adding the flour in 3 additions and the milk in 2 additions (begin and end with dry ingredients). After everything has been incorporated, increase the speed to medium-low and beat for 3 minutes or until dough is smooth and slightly elastic. With lightly floured hands, press and stretch the dough into the pan. If the dough resists, allow dough to rest for 15 minutes. Cover loosely with plastic wrap and allow dough to rise for 2 hours. When the dough is done rising, preheat oven to 350F. In a medium bowl, sift together flour and cornstarch. Stir in the salt. In a large mixing bowl, beat together the butter, sugar, and corn syrup until light and creamy, about 2-3 minutes. Beat in the egg and vanilla for another minute. Add the flour mixture alternating with the milk, adding the flour in 3 additions and the milk in 2 additions (begin and end with dry ingredients). Spread filling on top of dough. Bake 20- 25 minutes until top is crisp and golden brown (toothpick may still have some batter on it when inserted in the center). Let cake cool completely. Right before serving, sprinkle with powdered sugar. So glad to learn about gooey butter cake. I’ve never tried any of those and this recipe is on my list to make this Summer. Yes, I’ve seen the cream cheese variation before. I wanted to stick as close to the original as possible in honor of my St. Louis vacation. OMIGOSH I’ve never seen a gooey cake recipe that doesn’t use cake mix, I love that this doesn’t! YES! Do I have to refrigerate if I make it previous day of a function? No, but make sure you cover it so it stays fresh.